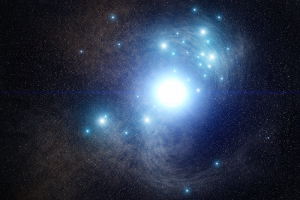 Artist’s rendering of Progenitor Star to a Type Ic Supernova, a blue supergiant star that once existed inside a cluster of young stars in the spiral galaxy NGC 3938, located 65 million light-years away. PC: NASA/ESA/J. 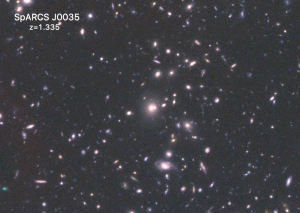 OLMSTED (STScI). 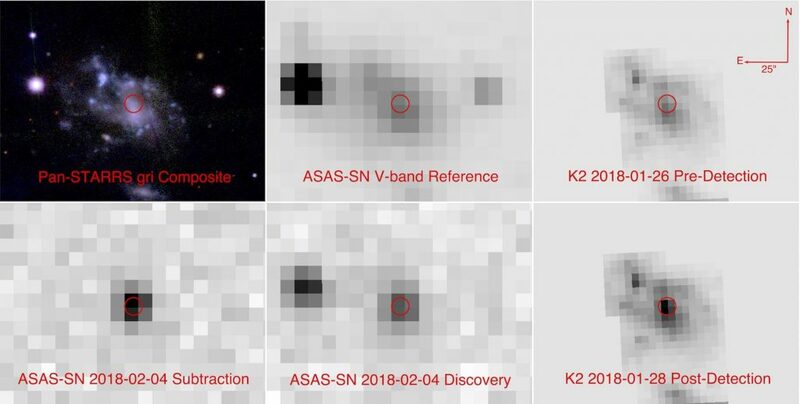 After sifting through image data from NASA’s Hubble Space Telescope and conducting follow-up observations using W. M. Keck Observatory, astronomers may have uncovered a long sought-after parent to a specific type of supernova. Known as a type Ic, the supernova is thought to detonate after a massive star has shed or been stripped of its outer layers of hydrogen and helium. These stars could be among the largest known—at least some 30 times larger than our own Sun. Even after shedding some of their material late in life, they remain very large and bright. In 2017, astronomers got lucky when they observed a nearby star combusting as a type Ic supernova. 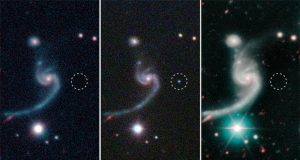 Two teams of astronomers pored Hubble archive images for signs of the parent star in pre-explosion photos taken in 2007. The supernova, catalogued as SN 2017ein, appeared near the center of the nearby spiral galaxy NGC 3938, located roughly 65 million light-years away. The discovery could yield important insights into stellar evolution, including how the masses of stars are distributed when they are born in batches. His team’s paper was published in June in The Astrophysical Journal. 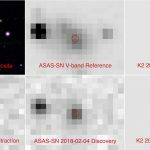 A second team led by Charles Kilpatrick of the University of California, Santa Cruz, also observed the supernova in June 2017 in infrared images captured using Keck Observatory. Kilpatrick’s team then analyzed the same archival Hubble photos as Van Dyk’s team to uncover a possible source. Analysis of the object shows that it is blue and extremely hot. The results from Kilpatrick’s team analysis turned out to be consistent with the earlier team’s conclusions. Because the object is blue and exceptionally hot, both teams suggest two possibilities for the source’s identity: the progenitor could be a single hefty star between 45 and 55 times more massive than our Sun. Or it could have been a massive binary-star system in which one of the stars weighs between 60 and 80 solar masses and the other roughly 48 suns. In the latter option, the stars are orbiting closely and interact with one another. The more massive star is stripped of its hydrogen and helium layers by its nearby companion, and eventually explodes. Expectations on the identity of the progenitors of type Ic supernovas have been a puzzle. Astronomers have known that the supernovas were deficient in hydrogen and helium, and initially proposed that some hefty stars shed this material in a strong wind (a stream of charged particles) before they exploded. When they didn’t find the parent stars—which should have been extremely massive and bright—they suggested a second method to produce the exploding stars that involves a pair of close-orbiting, lower-mass binary stars. In this scenario, the heftier star is stripped of its hydrogen and helium by its companion. But the “stripped” star is still massive enough to eventually explode as a type Ic supernova. Type Ic supernovas are just one class of exploding star. They account for 21% of massive stars that explode from the collapse of their cores. The teams caution that they won’t be able to confirm the source’s identity until the supernova fades in about two years. The astronomers hope to use either Hubble or the upcoming NASA James Webb Space Telescope to see whether the candidate parent star has disappeared or has significantly dimmed. 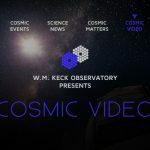 They will also be able to separate the supernova’s light from that of stars in its nearby environment to calculate a more accurate measurement of the object’s brightness and mass.